616 pages | 25 Color Illus. | 168 B/W Illus. This book is devoted to investigations of non-stationary electromagnetic processes. It offers a good opportunity to introduce the Volterra integral equation method more widely to the electromagnetic community. The explicit mathematical theory is combined with examples of its application in electromagnetic devices, optoelectronics, and photonics, where time-domain methods become a powerful tool for modeling. Particular consideration is given to electromagnetic transients in time-varying media and their potential applications. "This unique book provides an excellent insight, based on rigorous mathematical treatment, into non-stationary electromagnetic phenomena. While mathematically correct, the book offers easy-to-understand example results presented in numerous plots, graphs, and tables. Consequently, the book is a valuable and inspiring reference for researchers and students interested in time-dependent electromagnetic problems and their arising applications." "This book is a fundamental work on the interaction of an electromagnetic field with media whose characteristics change with time. It is very useful as anyone can find description of practically all main effects in such phenomena." "This book describes the important and interesting field of time-varying materials and boundaries, written by well-known experts in this area, who have contributed to the solution to many electromagnetics-related problems in the past. The book starts with a description of the required mathematical tools and then shows various concrete applications. This is the first comprehensive book about this material and therefore of particular interest to people working in this area. Scientists working on electromagnetic field theory in general, too, will find a lot of interesting material here." 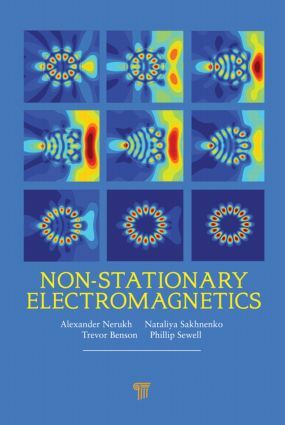 "Non-Stationary Electromagnetics is a masterpiece by top experts in electromagnetics: This magnificent work guides readers through the mysterious world of non-stationary electromagnetics. Its very first sentence catches them and sets free their imagination to expect and see the newly discovered sides of our nature." "In this book, the results of long-term efforts are presented that were aimed to create a comprehensive and complete description of electromagnetic wave propagation in media with time-varying parameters. The authors, highly recognised in this field, study problems of non-stationary electrodynamics on the basis of boundary integral equation formulations. They successfully combine the mathematical theory with application examples. This rigorous and at the same time easy-to-understand explanation of non-stationary electromagnetic phenomena will be of great interest to researchers from the physical science community.